ATLAS 1 on Haleakala is now fully operational and routinely discovering new Near Earth Asteroids. It is still fitted with a corrector lens that has known optical problems; when its replacement is fitted, scheduled in April 2016, ATLAS 1's productivity should improve by a factor of five. We are expecting the second ATLAS telescope to be delivered by August 2016 and installed in the Mauna Loa dome shortly afterwards. 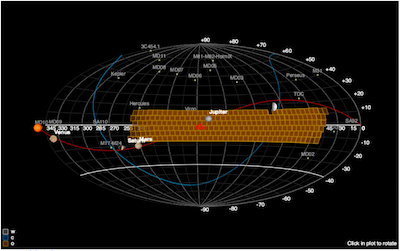 As of March 31, ATLAS 1 has discovered and reported ten new Near Earth Asteroids (NEAs) to the Minor Planet Center. Four of these are also classified as Potentially Hazardous Asteroids (PHAs). It has also discovered one comet. This discovery rate is not yet competitive with that of, say, the Catalina telescope, but it is encouraging that the ratio of ATLAS's PHA discoveries to its NEA discoveries is higher than that of Catalina, since it is PHAs that ATLAS is optimized to find. 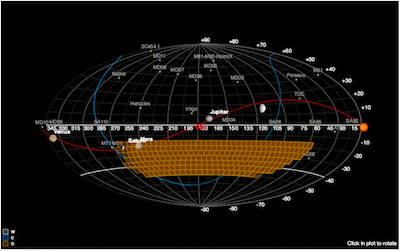 Up-to-date statistics of ATLAS's discovery rate can be found on one of the Minor Planet Center's webpages: ATLAS 1 on Haleakala has the designation T05. ATLAS 2, when it is ready, will have the designation T08. How does ATLAS spend its nights? 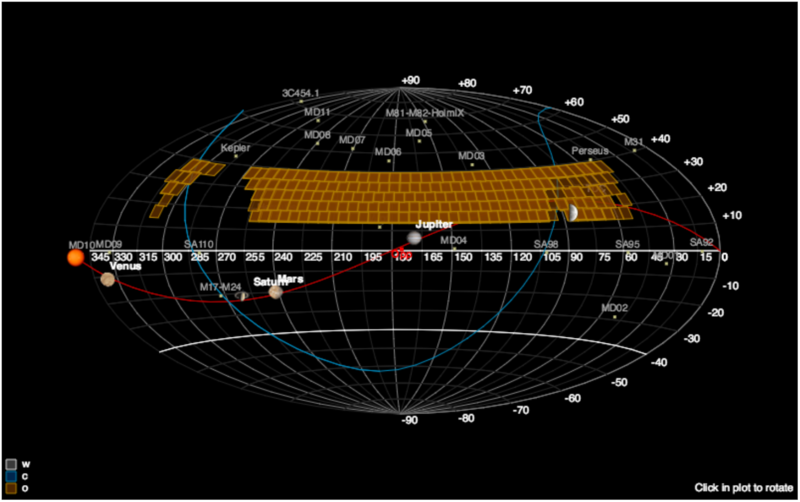 On a cloud-free night, ATLAS 1 is programmed to observe about 200 individual 6-degree diameter fields. Four 30-second exposures are obtained of each field, spread over a 90-minute interval. Each night ATLAS covers about one quarter of the available sky so that, weather permitting, ATLAS 1 will scan the whole nighttime sky visible from Hawaii every four nights. As soon as a set of four images is complete, one of the computers in the dome scans the images looking for apparently moving objects. It starts by taking a list of all known asteroids - about 700,000 - and calculating if, and where, they should be found on the field under study. 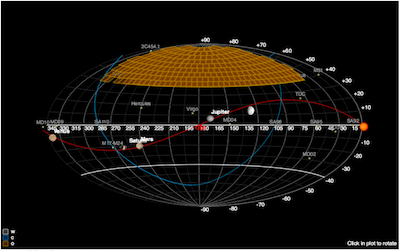 In a typical field in the ecliptic plane it may find several dozen such objects. Whenever it finds an already-known asteroid it measures its position accurately and forwards it to the Minor Planet Center's database. Any moving objects it finds that cannot be identified with a known asteroid is flagged and placed on a list. 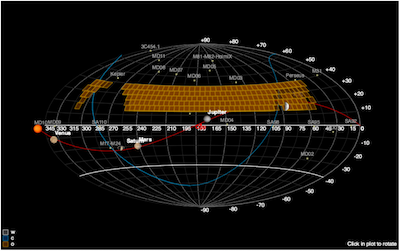 A group of images showing the motion of an asteroid during a series of four ATLAS exposures. This object is the ATLAS discovery 2016BZ14, a 75-m diameter PHA. 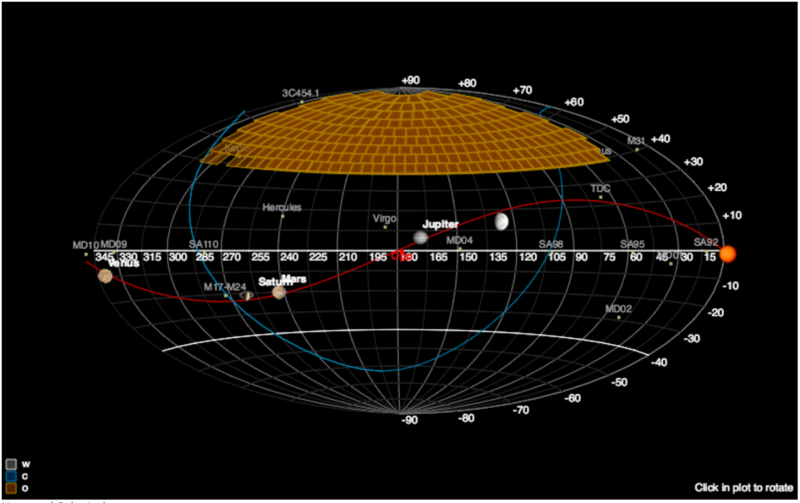 This image is about 9 arcminutes across. The asteroid was about 0.3 astronomical units from the Earth when these images were taken, and had a brightness of about 18.2 magnitudes in the w-band. After joining the project team to test, verify, and help develop the data management pipelines, our Queen’s University Belfast colleagues have kick-started the search for all things explosive in ATLAS. 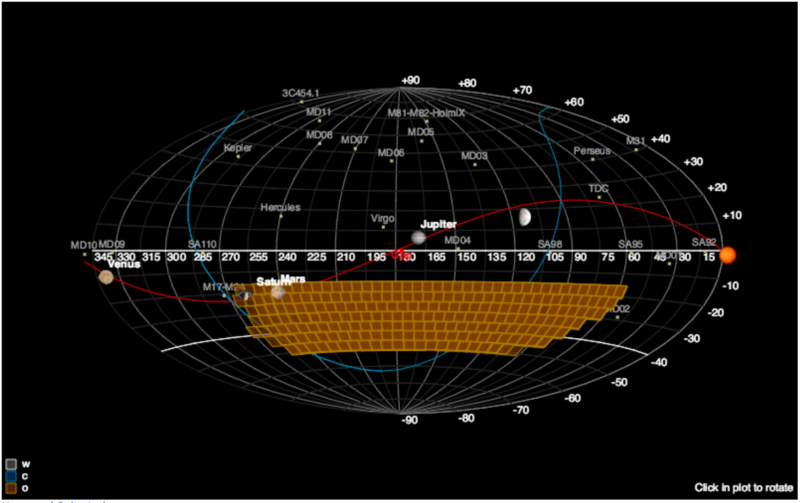 The team there of Stephen Smartt and Ken Smith, who have also been heavily involved with the Pan-STARRS project, search through all the nightly ATLAS images for new supernovae, high amplitude AGNs, stellar variables and any unusual-looking transients. No special observations need to be made for these studies. The ATLAS team has now discovered 27 supernovae and announced these via the new IAU Transient Name Server, and we announced the start of our supernova and transients search in the Astronomer’s Telegram Number 8680. This is the first of many planned announcements, and already in March we are sending weekly updates and reports on our discoveries (see, for example, telegrams 8805 and 8839). 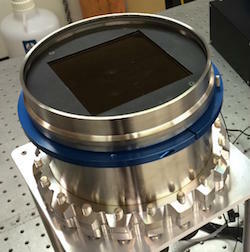 Brian Stalder is busy sifting through these discoveries and triggering our time on the University of Hawaii's 2.2m telescope with the SNIFS spectrometer to classify the supernova candidates. Brian classified the “double supernovae” in IC2150 as a Type II and a Type Ia. In an unusual, but not statistically improbable coincidence, these two supernovae exploded within a few days of each other in the same galaxy (see our telegram here ). Our current rate of discovery is about 1-2 supernovae per day brighter than 19th magnitude, providing a rich source of bright transients. We are committed to making our discoveries public quickly to allow the community to follow them up. The observatory at Mauna Loa is now fully fitted out with its mount and its computer systems; its camera (left) has been fitted with its CCD detectors, and is sitting in the ATLAS Manoa workshop. We expect to have the ATLAS 2 observatory fully operational just a few days after we receive delivery of the telescope from DFM. 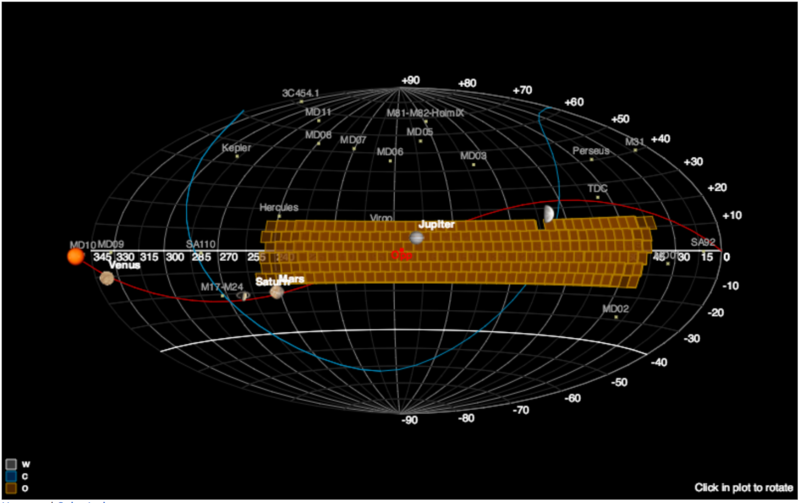 In the meantime, the fish-eye camera on the ATLAS 2 dome has been continuously monitoring some 10,000 bright stars. 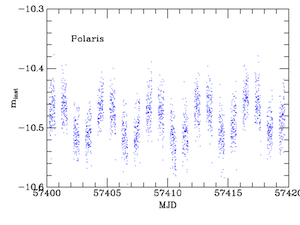 The figure on the right shows 20 days worth of observations of the star Polaris, an established Cepheid Variable. It is fluctuating by about 0.1 magnitudes with a period of 4 days. With the upcoming replacement of ATLAS 1's corrector lens and the installation of the ATLAS 2 telescope, ATLAS will cover more than half of the accessible sky each night. We have been invited by NASA to propose the construction of two more telescopes in order to provide weather diversity and (ideally) access to the far southern sky that cannot be seen from Hawaii. One of these telescopes will likely be sited in South Africa, while multiple locations are being considered for the other. By the installation of ATLAS 4, the survey will cover the entire sky every night.